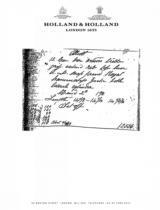 Holland & Holland records show that this gun, No. 12536, was finished in 1889 for 'Elliot' and is a very lovely example of Holland & Holland's 'flag ship' gun. The origin of the replacement barrels is unknown but we know from the proof marks that they were made some time 1954 and 1972. Records of rebarrelling of these early Royals is notoriously patchy and all we can say is that the work is of top quality and may have been done in house by the Makers. The restocking is thought to be more recent but we have no indication of just when it was done. 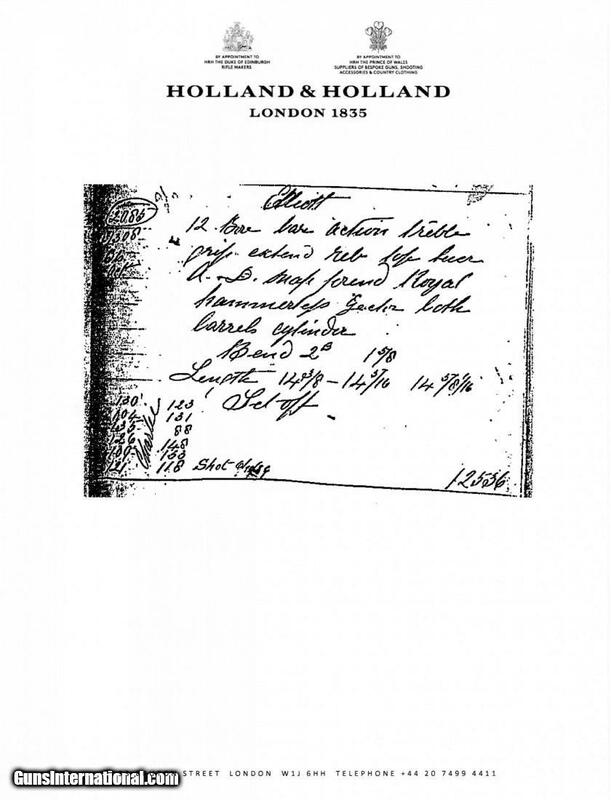 However it is the work of a professional and very experienced stocker and this might lead one to assume that the work was done by a stocker with considerable experience of H&H stocks, maybe even an ex-H&H worker. The gun balances exactly on the hinge pin. 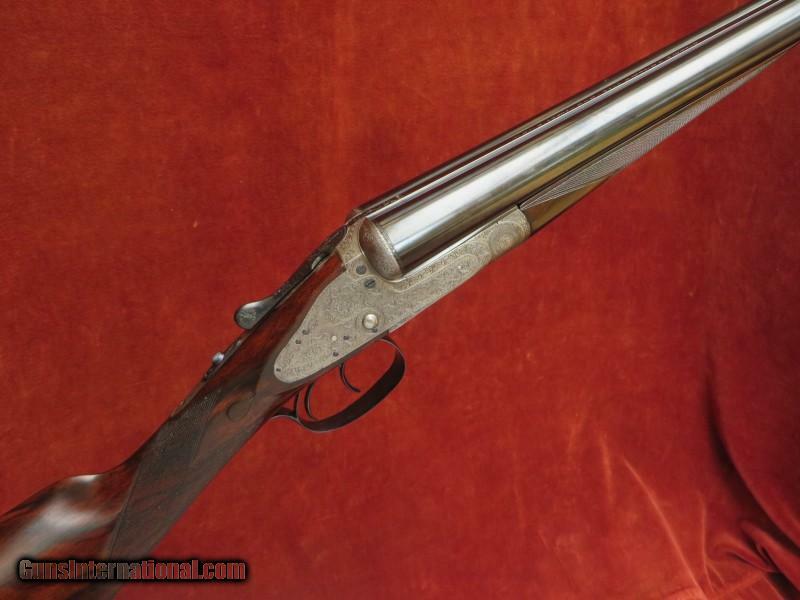 With its excellent weight and balance, interceptor sears, fine stock and barrel dimensions, this gun would make a superb target or game gun for the discerning shooter. *** Recently refurbished in the UK by Toby Barclay of Heritage Guns the action is of combined Holland & Robertson design and features: Rounded action; Bar action, 'Dip Edge', nine pin locks with bolstered tumbler pivots; Double triggers bolted by an automatic top tang safety slide; Breech face 'Gas Checks'; 'Block Patent Safety' interceptor sears; Top lever operating a 'Purdey Bolt' by way of a 'Scott Spindle'; Top rib extension providing a 3rd bite; Holland's patent cocking levers; Holland & Robertson's patent ejector and Anson's push rod forend catch. Gun weighs 7lb. Engraving style Best Fine Bouquet & Scroll. '"THE ROYAL" PATENT SAFETY HAMMERLESS EJECTOR' on underside of action; Top lever engraved 'HOLLAND & HOLLAND PATENT NO.23'. Gold inlaid 'SAFE'. Trigger pulls measure approximately: Front trigger 3 ¼ lbs Rear trigger 4lbs. 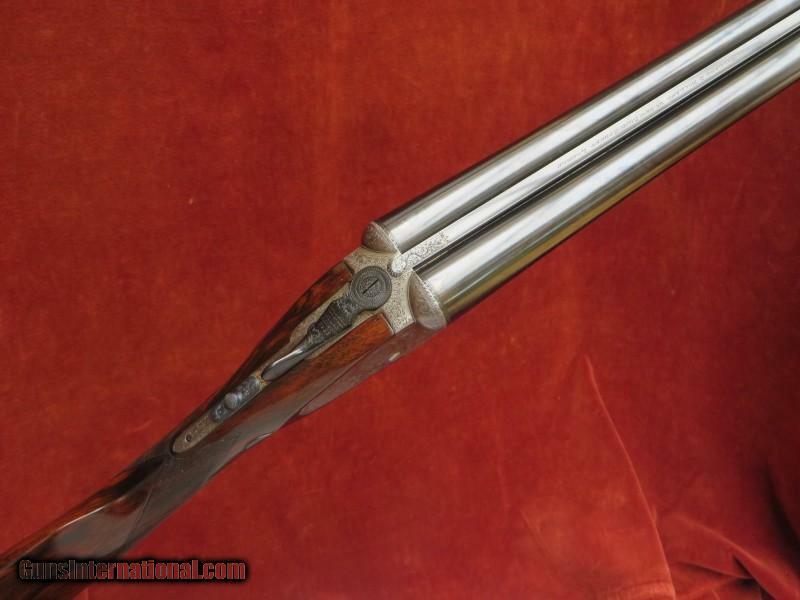 The replacement steel barrels are 28" in length, chambered for 2 3/4" (70mm) cartridges and are of brazed 'dovetail' construction with soft soldered ribs. Top rib is of concave game type. Bores are clean and bright.London proof for 70mm nitro powder cartridges 1954-72. The right barrel is bored 0.730 and has a constriction of 0.009 for Improved Cylinder choke. Minimum all thickness is 0.030. The left barrel is bored 0.730 and has a constriction of 0.026 for Modified choke. Minimum wall thickness is 0.031. 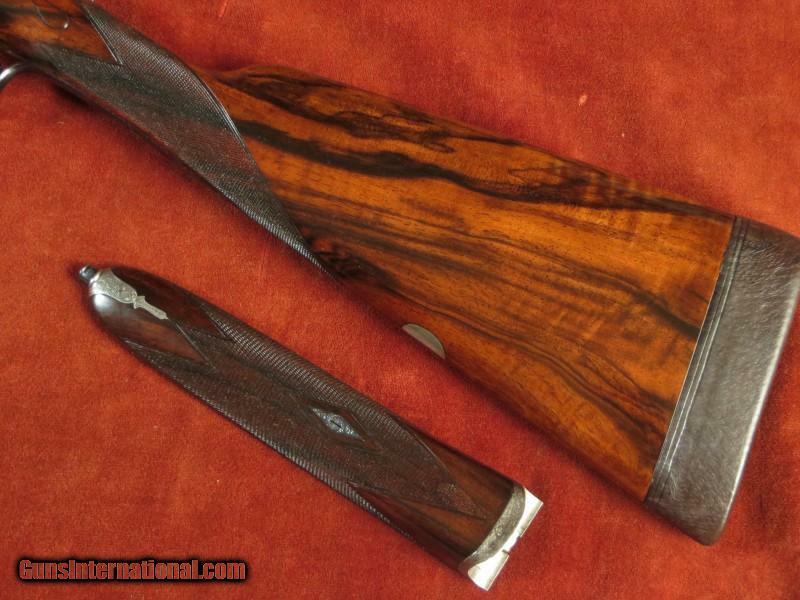 *** The replacement straight hand stock and original splinter forend are crafted from boldly figured walnut. 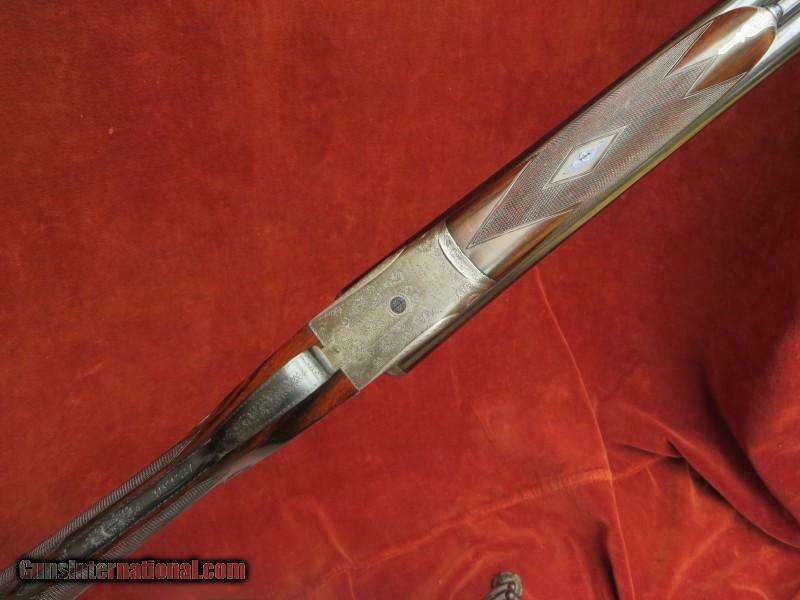 The stock is lightly cast off for a right-handed shot, features a vacant white metal oval, well defined drop points and is finished with a 1 ¼" leather covered recoil pad. 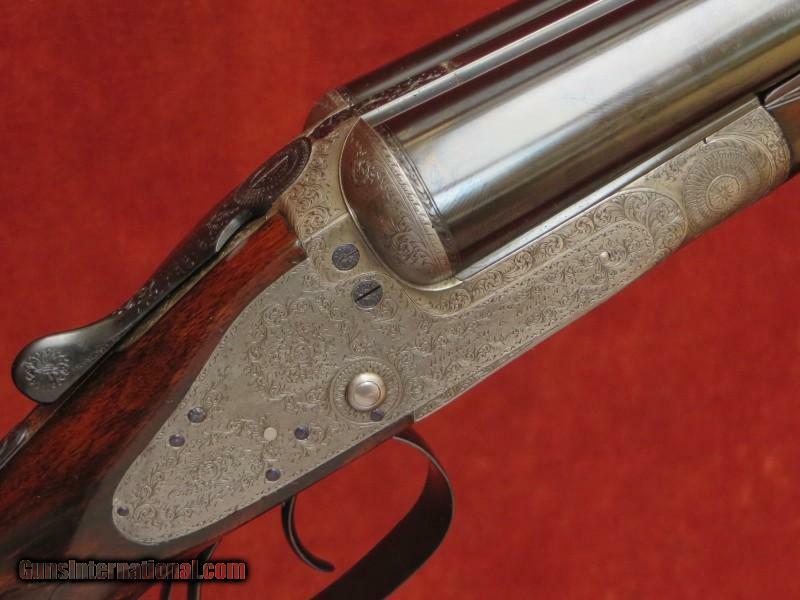 There is one small inlet repair to the forend edge and a second at the knuckle. 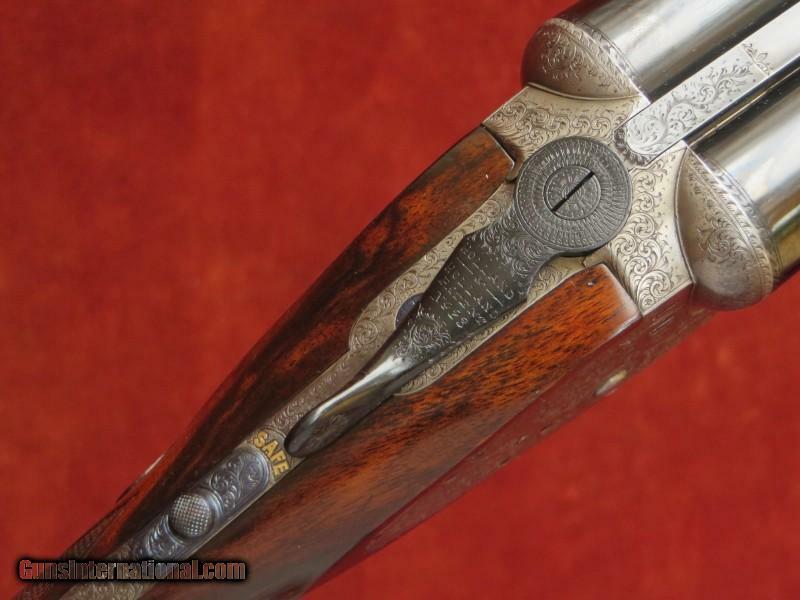 The forend is fitted with a finely engraved, steel forend tip, diamond and Anson pushrod tip.The 26 lines per inch chequering has been freshened to normal sidelock pattern. Stock dimensions are 14-7/8” over a 1-1/4” leather pad by 1-9/16” by 2-3/8”. Slight cast off for right hand shooters. The stock is finished with a traditional linseed oil based preparation as used on best guns by one of the top English makers. This finish uses no grain fillers to achieve its deep, smooth lustre, only many hours of alternate build and flatting off of the surface. *** A very handsome Holland that you will be proud to own. Life is short. *** Isn't it time to reward yourself? 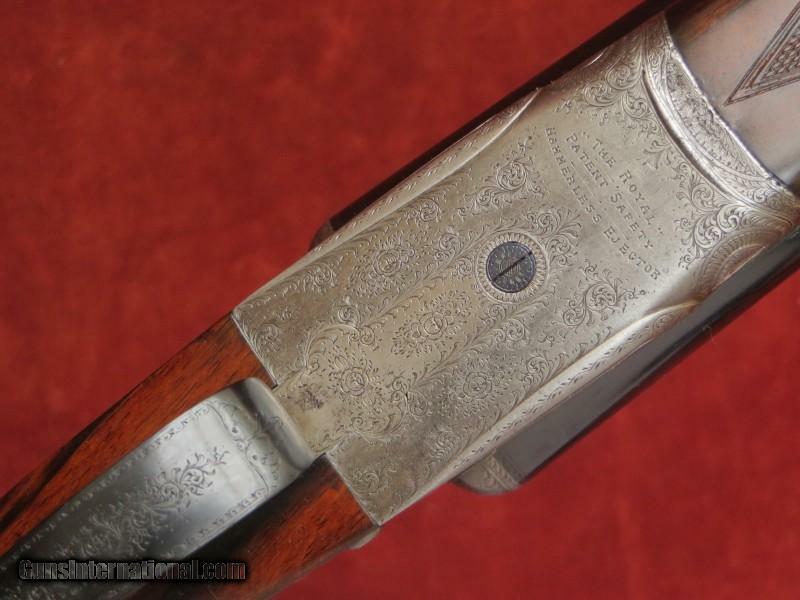 This beautiful Holland is classified as an antique firearm and will not require an FFL. Not for sale where prohibited by state or local laws. Buyer is responsible for all shipping, insurance, and any other related charges. I give a 3-day non-firing inspection period and will only accept returns at buyer’s expense if the gun is not as described in the listing. *** US Agent for Heritage Guns UK. 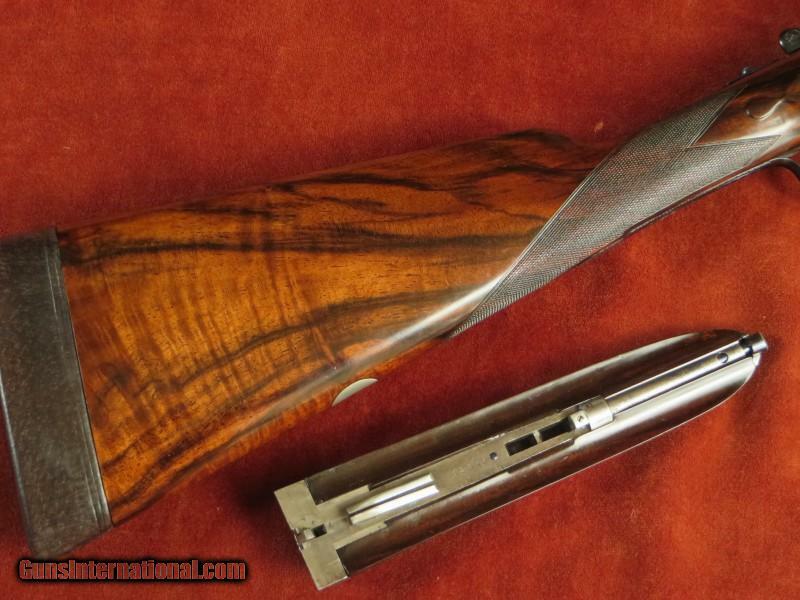 *** Come and see this great double and other fine firearms at the MacNab booth at the SOUTHERN SIDE-BY-SIDE April 25 - 28, 2019 at Deep River Sporting Clays in Sanford, North Carolina. *** We are pleased to announce that noted British firearms author DONALD DALLAS will be at our booth the same weekend autographing and selling his books and answering your questions about British double guns.